It's been a while since I last blogged, and that's primarily because I was kinda busy with work and life and erm, preparing for this trip (my friends and I have been preparing for this trip since February, but we didn't actually prepare for it until a week before the trip). So yeah, here's a brief summary of what to look out for in these three places. We arrived at Surabaya from KL and stayed at Da Rifi hostel, and hired a tour van to bring us to Mount Bromo. Oh by the way do you know why Surabaya is called Surabaya? Surabaya is locally believed to derive its name from the words "sura" or "suro" (shark) and "baya" or "boyo" (crocodile), two creatures which, in a local myth, fought each other in order to gain the title of "the strongest and most powerful animal" in the area according to a Jayabaya prophecy. This prophecy is sometimes interpreted as a conflict between Mongol forces and Raden Wijaya's Majapahit forces. Now the two animals are used as the city's logo, the two facing each other while circling, as depicted in a statue appropriately located near the entrance to the city zoo. There's another story detailing two heroes whose names were Sura and Baya, who fought each other in order to be the king of the city. 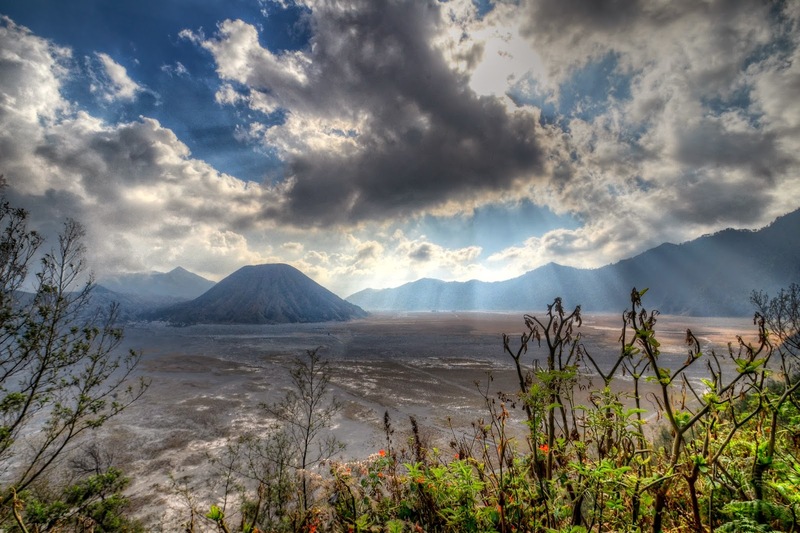 Bromo is an active volcano located 4-hours away from Surabaya. The name "Bromo" is derived from the name of the Hindu god Brahma, and thus you'd expect a majority of the people here to be Hindu. These people, who live at the edge of the volcano, are the Tengger people who, according to our driver, think of themselves as the direct descendents of Majapahit princes. By the way, if you ever plan to go to Mount Bromo, please make sure you bring enough clothes because at 2,329 meters above sea level it's almost impossible to ignore the cold. Also, remember to bring a face mask because otherwise you'd be breathing in tonnes of volcanic ashes. The view of Mount Bromo and Batok from the viewing point was simply breathtaking—definitely well worth the trouble—and here we could even see the milky way with our naked eyes. When visiting the Bromo crater, you will be asked whether to ride a horse up to the crater or walk. I chose riding the horse and regretted it soon after. The horse I'd chosen was actually a juvenile; it coughed a lot and struggled to breathe because it had to carry passengers all the way up to the crater while breathing in the ash-filled air. After a while on the horse I began to regret my decision. And it farted a lot, too. The horse I was riding was actually a juvenile, probably not yet accustomed to the harsh environment and the ashes coming off the volcano. It farted, coughed, sneezed and struggled to breathe like an asthmatic old man. Image: Foo Chee Soon. And a lifetime of living near the volcano and breathing in tonnes of volcanic ashes would certain pose some kind of health hazard to these poor animals. It's a classic example of animal abuse. After done visiting the crater, I let the horse off and walked back to the jeep instead. After Bromo, we were taken on a 6-hours ride to Mount Ijen. Mount Ijen, unlike Mount Bromo, is actually a dormant volcano. We arrived at the Ijen foothill and had to walk for 1.5 hours to reach the crater. Inside, we saw blue fire igniting on the sulphur and gosh I've got to say the flame was so mesmerizing. And it smelled so bad. 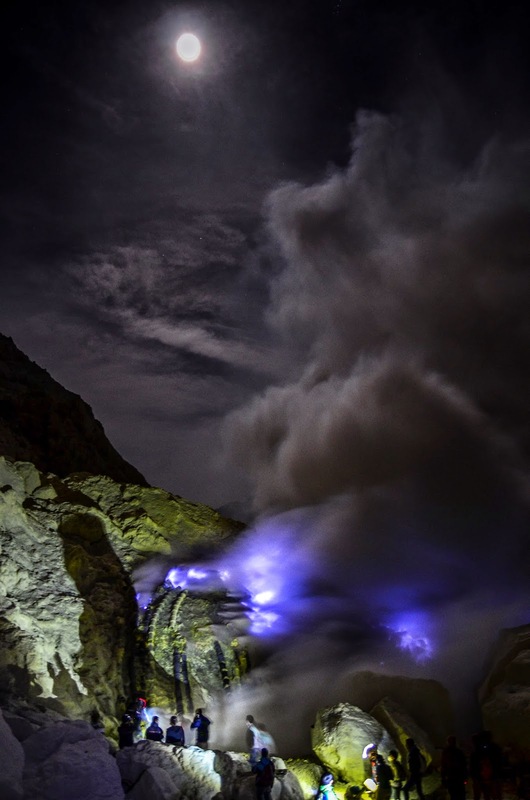 This blue glow—unusual for a volcano—isn't, of course, lava. Sulphuric gases emerge from cracks in the volcano at high pressure and temperature—up to 600°C, and when they come in contact with the air, they ignite, sending flames up to 5 meters high. Some of the gases condense into liquid sulfur, which continues to burn as it flows down the slopes, giving the feeling of lava flowing.—National Geographic. 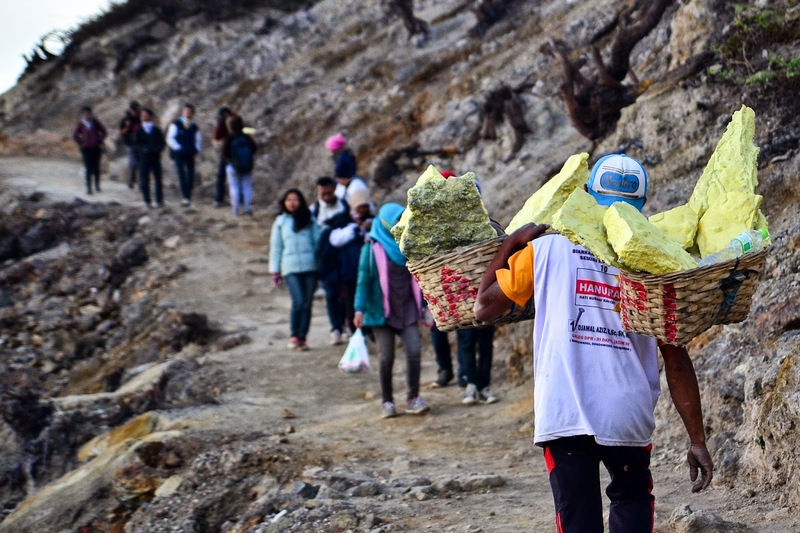 There is a sulphur mine currently in operation in the Ijen crater, and according to some sources these miners earn a meagre 50,000-75,000 rupiah a day—that's roughly RM 15 a day for carrying baskets laden with heavy sulphur blocks and walking the rugged pathway in and out of the crater. A miner carries baskets laden with sulphur block. Like Bromo, this place is cold and the air is filled with the smell of pungent sulphur and volcanic ashes. By the time I arrived at the bottom of the crater my eyes were welled with tears, my throat burning and my nose thoroughly blocked with mucous. Then we went for another 7-hours drive to Bali. Bali, like Bromo, is a Hindu stronghold. Legend has it that when the Majapahit kingdom in Java collapsed during the 15th century, Hindu aristocrats and peasants fled to Bali to escape Mataram Sultanate's Islamic conversion. And so you'd expect to see a lot (literally hundreds of 'em) of Hindu temples in Bali. At Bali, we stayed in the CX Hostel in Jalan Legian, Kuta. It's located near the beach and only around an hour's drive to all major attractions. We rented two motorcycles (at 45,000 rupiah a day) from one of the travel shops scattered along Jalan Legian. Two pieces of advise to my fellow travellers: do not, and I mean DO NOT, give in when you are told to pay anything more than 50k rupiah (a day) for a motorcycle. And do not buy the bensin (comes from the word benzene, I supposed?) you see in shops along the road, just waze or GPS your way to a proper petrol station and fill in with premium. The bensin costs 7k rupiah for 750ml, whereas at the petrol station you get a litre of premium petrol for 6.5k (19 Oct 2014) rupiah. 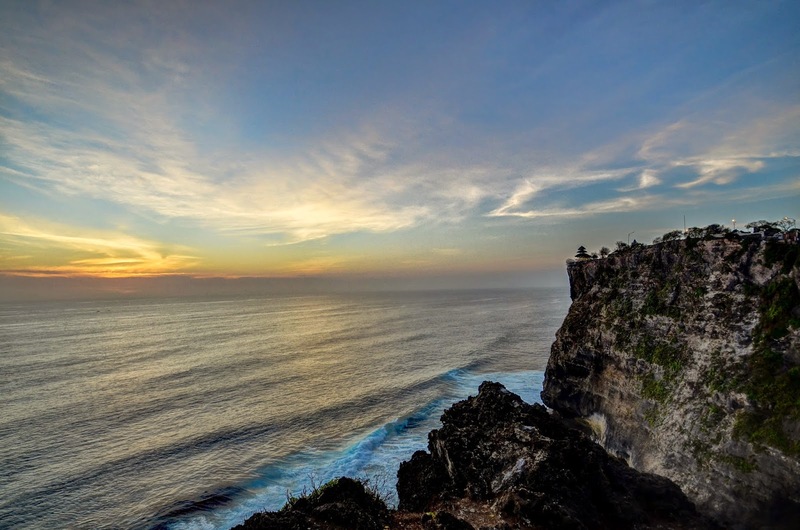 The highlight of this temple is the cliff, the sea and the sunset. There's a cultural show you can watch in the temple as well. Be wary of the monkeys though—I didn't heed the warning displayed at the entrance and paid heavily for the consequence: while at the cliff, I was looking through my camera to shoot a picture when whoosh, a monkey sneaked up right next to me and, in a burst of lightning speed, snatched my spectacles right out of my face! I later found out that I wasn't the only victim that day. Damn those monkeys. 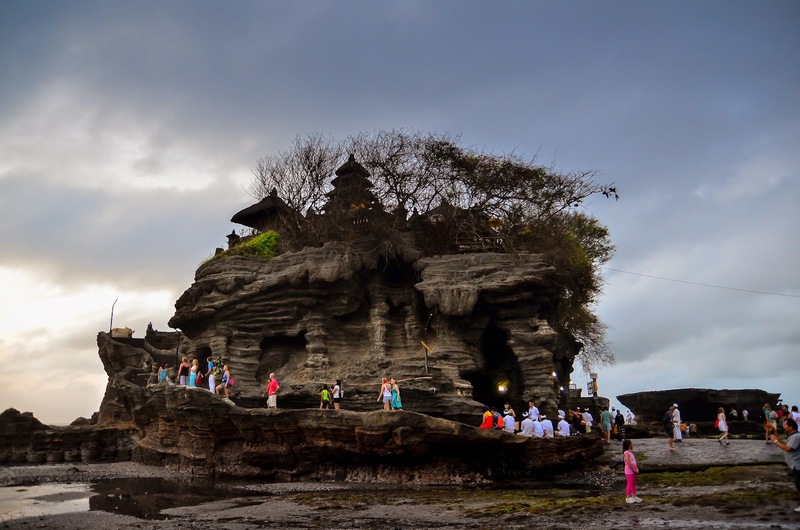 This temple, also known as the Temple in the Sea, is located roughly 25 km away from Kuta. We managed to evade the troublesome motorcycle parking and parked at some illegal parking spaces and pretended nothing happened. And, as the name suggests, it's a temple, errr, in the sea. The temple faces westward, and thus you can get to see awesome sunset here. This temple is pure awesomeness. The temple has a pond in which people may come and bathe. Legend has it that the pond was created by the Hindu God of Warfare, Indra, in an attempt to revive his poisoned forces during the war against the evil Mayadanawa. 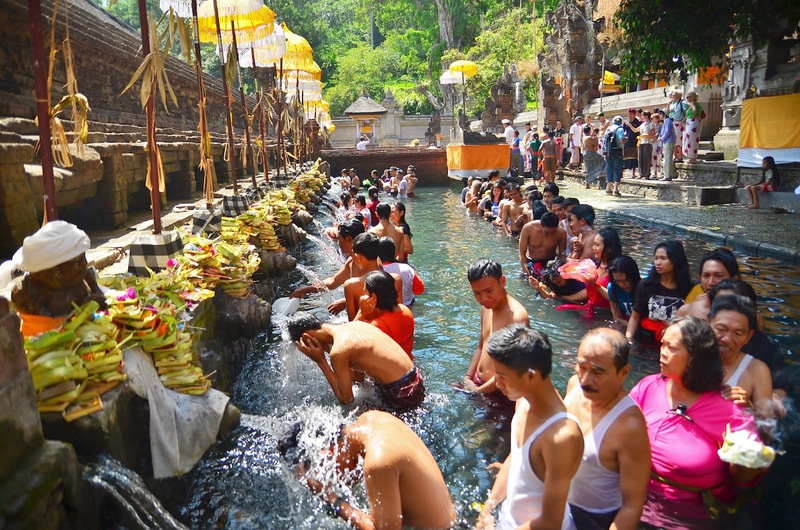 Balinese believe that soaking themselves in the water could ward off evil and bring good luck. One thing I've observed during my stay in Indonesia is the severity of corruption in this country. For several times I saw our driver giving out "token of appreciation" to guards and guides to expedite the registration of document etc. Upon reaching Bali, he once again gave some money, this time to the police manning the wharf, and said "here in Indonesia, 20k (rupiah) can solve all problem, there's no need for ID inspection anymore". Let's face it, corruption occurs in all parts of the world. But it is especially rampant in Indonesia. It's easy to put the blame on the government for not taking a stronger stance in fighting corruption. But the locals themselves, driven by poverty, often find it difficult to resist the temptation of taking bribes. According to the World Bank, out of Indonesia's population of 237 million, roughly 28 million—a number equals to the entire population of Malaysia—live below the poverty line, and approximately half of all households remain clustered around the national poverty line set at 200,262 rupiahs per month. Another phenomenon that's evident during our stay in Indonesia is the gap between the rich and the poor. At Surabaya, we paid 8000 rupiah (around RM 2.168) for a plate of noodles with an egg and a cup of coffee. If you think that's ridiculously cheap, well it is ridiculously cheap. Let me remind you that Surabaya is the second largest city in Indonesia. Putting that into perspective, it's like getting a meal for less than RM 3.00 in Penang. Meanwhile, we paid, on average, 25,000 rupiah per person for the hawker food in Bali. To be able to get a meal at a mere RM 2.168 in the second largest city in the biggest Muslim country in the world means something must have gone horribly wrong at the administrative level. Compare that to a Bali masseur who earns a 15% commission from the payment paid by every customer. A typical Balinese massage, which lasts for an hour, costs 75,000 to 80,000 rupiah, which means a masseur earns about 11250 to 12000 rupiah per hour. Translating that into Malaysia Ringgit gives you roughly RM 3.05 to RM 3.25 per hour. Working on an eight-hours shift gives you a maximum of RM 26 per day; that's way above the poverty line of 200k-rupiah-a-month, but still not a lot, considering the fact that Indonesia boasts the largest economy in Southeast Asia. It's actually quite easy to understand the concern regarding the low cost-of-living in Surabaya and the opulent lifestyle of Bali; the salary in Surabaya is lower than in Bali, in line with the relatively lower cost-of-living in Surabaya compared to that of Bali. In fact the cost of housing in Bali is 54% more expensive than in Surabaya, and the overall cost-of-living in Surabaya is 21% lower than in Bali. Putting that into perspective, it's like you earning RM 1975 a month in Penang while your friend earns RM 2500 a month in Redang. Can you feel the pain now? Despite these discrepancies, the cost-of-living adjustment (COLA) and the cost-of-living index take account of a country's living costs in aggregate without distinguishing Bali and Surabaya. The high cost-of-living in Bali raises the overall cost-of-living in Indonesia—when in fact a vast majority of Indonesians still live on Surabaya-level income—thereby overshadowing the ever widening gap between the rich and the poor. Still, Indonesia is a good place to go. Do visit Bali if you haven't already, and don't forget Mount Bromo, too. The old man and the sea. Shot taken at Tanah Lot Temple. Image: Chin Kok Hoe. One last advice to travellers from other parts of the world who wish to go to Indonesia: look out for Malaysian travellers and stick to them like a gecko. You can't speak the language, and you thought you've done a great job by pulling down the price of the tour package from 400k rupiah to 200k rupiah. Malaysian can speak the Malay language—a language that bears a 90% resemblance to the Indonesian language—and without the language barrier we could get the same package for like, I don't know, 50k rupiah? And we speak English, too. Speaking the language helps a lot, in all kinds of way. p/s: The rest of the photos are on my facebook and yourshot account. 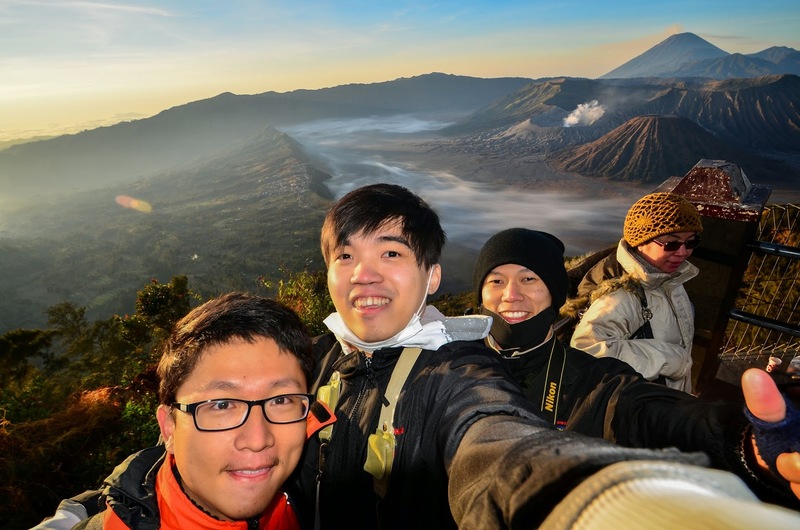 Yes, all about trip bromo-ijen-bali is mostly familiar by traveller who will visit Indonesia. Here is my tour and travel which can accommodate of this tour. Why Do Cats Love Being in Circles?